The FAA has confirmed that a UPS cargo plane has crashed outside Birmingham, Ala. NBC's Tom Costello reports. A large UPS cargo plane crashed early Wednesday morning near the airport in Birmingham, Ala., killing the pilot and co-pilot. Investigators on the scene are now assessing the conditions of the aircraft, officials said. “We are just at the very, very beginning stages of our investigation,” Robert Sumwalt, member of the National Transportation Safety Board said at a news conference Wednesday afternoon. Sumwalt added that investigators have not been able to recover the cockpit voice and flight data recorders as parts of the plane's fuselage are still smoldering. The pilot and co-pilot were the only people killed or injured in the fiery crash, Mayor William Bell said. Neighborhoods in a half-mile radius of the site were evacuated, he said. Flight 1354 crashed shortly after 6 a.m. at Birmingham-Shuttlesworth International Airport, the Federal Aviation Administration said. The Airbus A306 from Louisville, Ky., crashed while making an approach to the airport, according to UPS. The crash caused at least two explosions and strewed debris across a long path, according to NBC News affiliate WVTM. The plane crashed about 900 yards from the airport in an open field, WVTM reported. Police said no homes were affected by the crash. "This incident is very unfortunate, and our thoughts and prayers are with those involved," UPS Airlines President Mitch Nichols said in a statement. "We place the utmost value on the safety of our employees, our customers, and the public. We will immediately engage with the National Transportation Safety Board's investigation, and we will work exhaustively on response efforts." Sumwalt said initial information shows the aircraft came in through some trees and made the initial ground impact at the bottom of a hill, before going up the hill and resting at the top. He also said initial reports show there was no distress call from the cockpit. There was no unusual weather before the crash, and it was unknown if there were any mechanical issues, Bell said. A large cargo plane remains engulfed in flames after it crashed early Wednesday morning near the airport in Birmingham, Ala. Watch a portion of WVTM's live coverage. "It's my understanding the only individuals involved were pilot and co-pilot," Bell said. In a statement, UPS said it has reached out to the pilots' families to offer support. "All of us at UPS extend our deepest sympathies to the families and friends of these two crew members," said UPS Chairman and CEO Scott Davis. "Our efforts now are primarily focused on helping the families." "We place utmost importance on the safety of our employees, our customers and the communities we serve," Davis said. "UPS is participating in the investigation." While no structures were hit by the plane, Alabama Power reported that 76 customers were without power after the aircraft came into contact with power lines, according to WVTM. "The cockpit area was severed from the rest of the plane," Gaynell Hendricks, chairperson of the Birmingham Airport Authority, told WVTM. "It's a grim site." 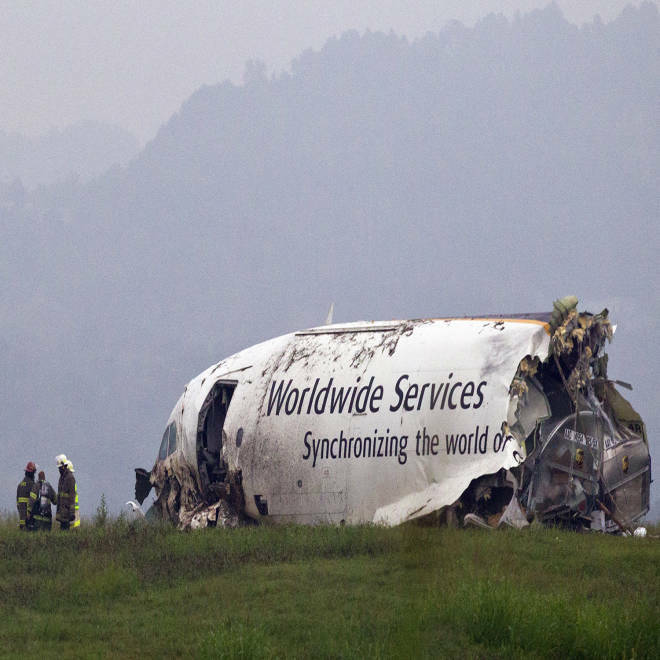 The aircraft involved in the crash had been delivered to UPS in 2003, according to a release from manufacturer Airbus. The plane had flown about 6,800 flights for an estimates total of 11,000 hours in the air. The plane was powered by Pratt & Whitney engines, according to the release. "The investigation remains the entire responsibility of the relevant authorities and it would be inappropriate to speculate into the cause of the accident," Airbus said in the release. The airport had normal flight operations at 8 a.m. local time, according to its official Twitter account. A UPS cargo plane lies on a hill at Birmingham-Shuttlesworth International Airport after crashing on approach, Wednesday, Aug. 14, in Birmingham, Ala. Toni Herrera-Bast, a spokeswoman for Birmingham's airport authority, says there are no homes in the immediate area of the crash.